Monday was good. Got a rare glimpse inside the historic U.S. Consulate here in Shanghai. Met a fellow Washburn. And saw one of the best musicians in the world perform. All in a couple hours. American folk musician Abigail Washburn — no relation, as far as we know — is in China promoting her new CD, which includes two songs Washburn sings in Chinese (she’s lived here off and on since 1996). 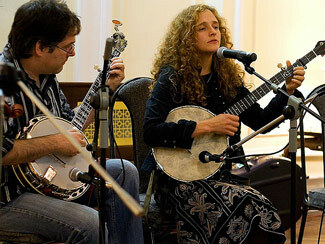 The album, Song of the Traveling Daughter, was co-produced by banjo player and living legend Bela Fleck, who also joined Washburn on her China tour. Washburn, Fleck, a violinist and a cellist performed an intimate invite-only — thanks for the invite, Paul! — concert last night at the U.S. Consulate on Huaihai Lu and Wulumuqi Lu (you know, the walled compound with armed guards across from the British Bulldog, a bar worth boycotting). The consulate occupies a grand old estate which likely has a fair bit of history, although my initial Google attempts turned up no details. It was nice just to have a look inside the place. I’d show you pics if my phone and camera weren’t confiscated at the gate for “security reasons.” Had a front row seat for the show. It was great. Abby’s voice is strong and beautiful. And Bela’s picking is amazing — when he solos it sounds like three or four banjos playing at once. (Also, I’m fairly certain he played part of one song with his teeth.) The band is playing another gig, open to the public, tonight at the Cotton Club. I encourage you to come. Just don’t take my seat! Brad’s camera was not confiscated. His pics start here. Looks like plenty of people took my seat. Show was sold out before 8 pm. Music didn’t start until after 10 pm. Needless to say, I didn’t go. Maybe next time they will choose a bigger venue. Béla Fleck (accented e) and the Flecktones are some of the most talented musicians around. I can hardley believe I never heard about one of my favorite musicians playing in Shanghai, and I’m kicking the walls right now in frustration that I missed him. You’re a lucky guy! Your reviews of these events is greatly appreciated. Fleck was in China and Mongolia once before, on his Asian tour, and got to meet players of the “sanxian” and similar Asian banjo-type instruments. I asked him a few years ago what it was like to meet these musicians and he told me he was disappointed; Fleck and his musicians were interested in learning about the Asian instruments, but the Asian musicians weren’t too interested in the American instruments, or bluegrass. I think he’ll have a better time this time, collaborating with Iz and the other Mongolian group. Bela may be a living legend - and I agree he is a great musician - but for my money give me Abby’s voice and sensitivity - truly otherworldly. And that hair! If I remember correctly (I grew up in Shanghai but lived in NY for too long), the consulate compound was once one of the estates of the Rong family, one of Shanghai’s richest families in 30’s/40’s and onward. Their fortune suffered a little after 1949, but one of their family members became the vice-president of China (in the early 90’s I believe). You may try to verfiy that. In any case, it is very close to my old family home. I am very jealous. Bela Fleck is simply amazing, I wish I was in Shanghai to catch his gig. Though I wonder how the turnout was in Cotton Club - it seems to me that bluegrass a bright spot of American music which has yet to gained its fair share of Chinese appeal.